Available with or without wheels, Rubbermaid high chairs are sturdy, easy to clean, and meet the latest ASTM 404-99 safety standards. The highchairs also come with a convenient handle for smoother maneuverability, and the trays can be detatched and removed with one hand. 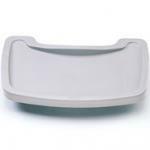 Colorful high chair trays can be ordered separately, and fit all high chairs shown on this page. Rubbermaid's high chair model #7806-08 is unique in that it offers Microban® antimicrobial protection, which helps prevent the growth of odor-causing bacteria and discoloration. 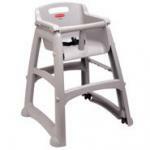 Our online catalog features Rubbermaid high chairs in three colors: dark green, platinum and black.